I don’t think we talk about Kate Hennig enough (related note: I saw her understudy in both Stratford shows last year and was thus Hennig-starved in 2013), so let’s talk about Kate Hennig a bit, shall we? 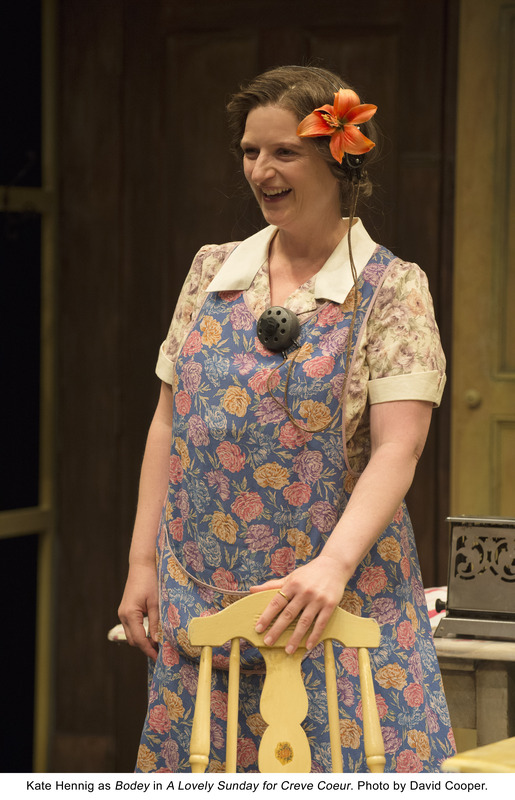 In the Shaw Festival’s lunchtime show, A Lovely Sunday for Creve Coeur, four musical theatre actresses take on Tennessee Williams and don’t sing at all (well, don’t sing much). What they do instead is deliver one of the most heartfelt and human productions of the season at the refreshing running time of only 55 minutes. The star turn comes, of course, from Kate Hennig who is so beautifully open and unconventionally strong as a lonely woman setting herself and others up for happiness as best she can. A rare gem from Williams’ wobbly late career, Lovely Sunday is about unlikely and true friendship between women. Beautiful and aspirational Dotty (played with only slightly grating clueless charm by Deborah Hay) lives with kind and dowdy Bodey (Hennig) in a small, unstylish apartment in St. Louis. There they live small lives full of unglamorous details (they discuss what paper flower will be best to hide Bodey’s hearing aid), small disruptions (their tragically lonely German neighbor Miss Gluck drops in constantly in search of coffee and comfort) and hopeful delusions (Dotty waits by the phone for a man who will never call while Bodey dreams of Dotty marrying her twin brother). Into this discontented but relatively cheerful place comes Kaylee Harwood as a stylish monster who further provokes Bodey’s protective instincts and Dotty’s insecurity. In a world populated by Hennig’s layered and inspiring Bodey and even Hay’s sympathetic Dotty, Harwood’s over the top Helena is a little too one-dimensional. I wish Williams had given her some sense of character beyond bourgeoisie but I suppose her function is to reveal the depth of the other characters rather than shine herself so she more than fulfills her role.